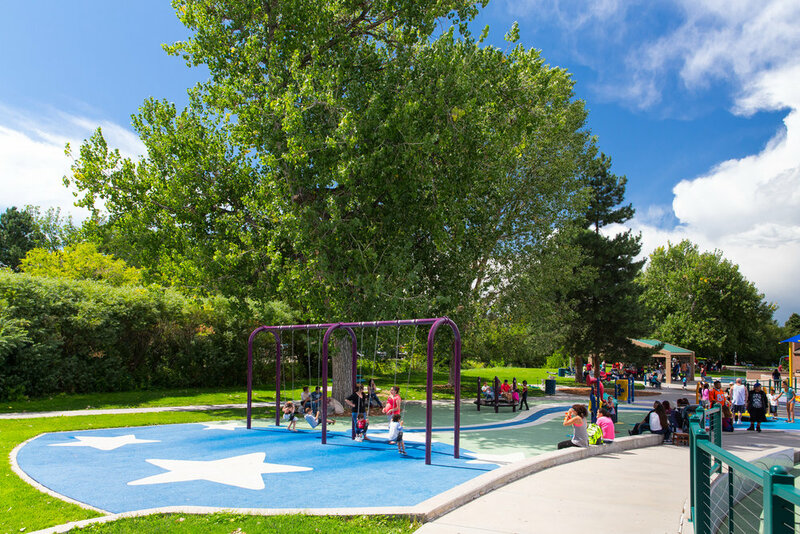 Accessible playground in Northglenn, Colorado near Denver embraces the senses in play with whimsical art, stimulating sounds, fragrances, and textures. 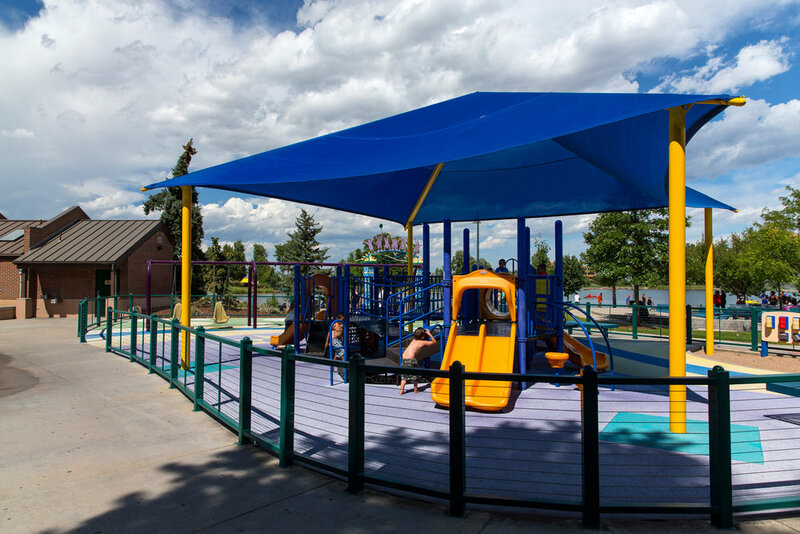 Northglenn Sensory Park offers adventures for all abilities. Design Concepts worked with Northglenn Parks and Planning Staff as well as service providers for senior and disabled communities, and the Adams County 12 School District, to transform the two-acre site of an aging playground into a park with fun, imaginative, and safe opportunities for children of all ages and abilities. 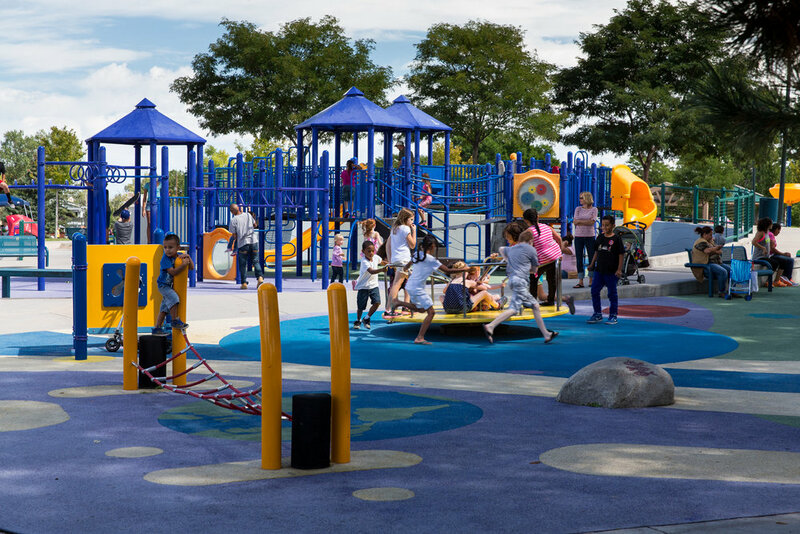 The goal was to make the entire park accessible not only for children with disabilities, but also parents and grandparents with disabilities who wish to play with their children. The design uses whimsical art as well as stimulating sounds, fragrances, and textures. 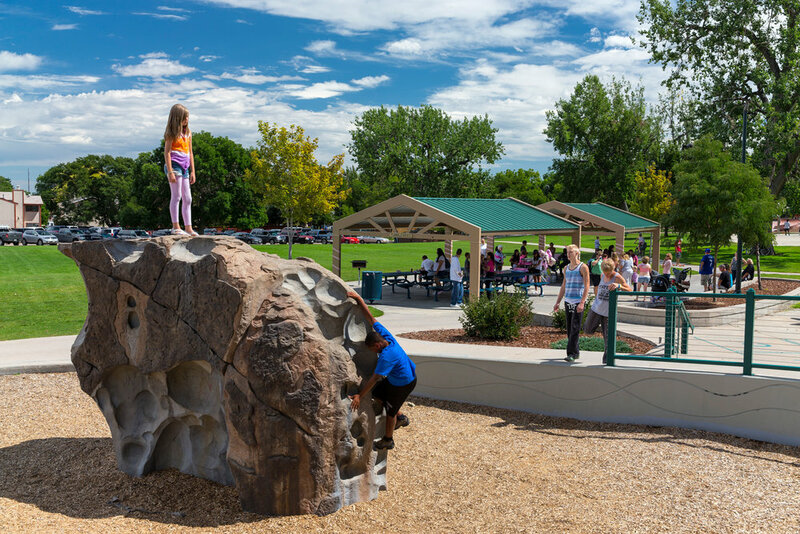 Custom arched metal gateways with cut-outs of children welcome park visitors, and sound panels and etched boulders enhance a creative play area. Stainless-steel "drum" table and stools provide musical opportunities. Several picnic shelters give plenty of space for family gatherings. In the water play area, stars embedded in the walk emit mist and streams of water. A sensory garden (to be planted in a future phase of construction) will feature trees, shrubs, and perennial plants such as sages, lavenders, and ornamental grasses. Looping through the garden is a wavy walk that undulates up and down in elevation, offering thrills for children riding tricycles, rollerblading, and using wheelchairs. Sand and water play offer a satisfying tactile experience for kids. 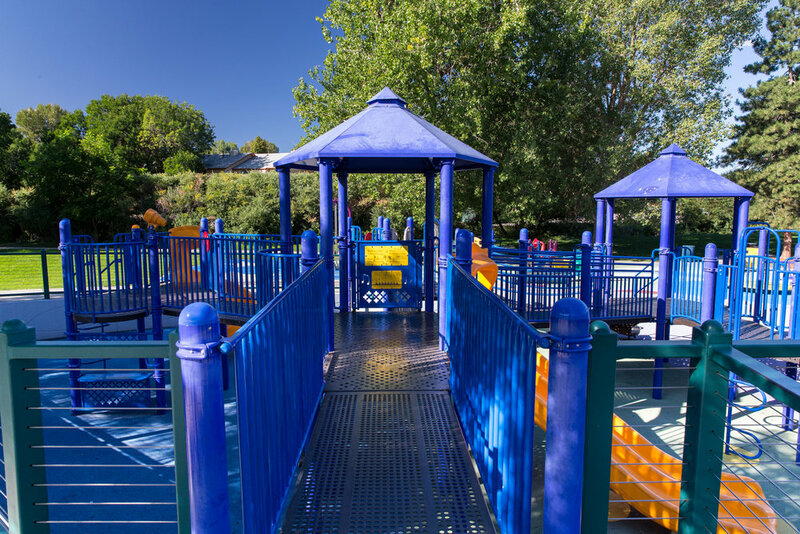 Northglenn Sensory Park surpasses federal regulations (ADA requires 50% accessibility) by providing nearly 100 percent accessibility for people who use wheelchairs. Design Concepts designed different levels throughout the park that allow direct access to play equipment. 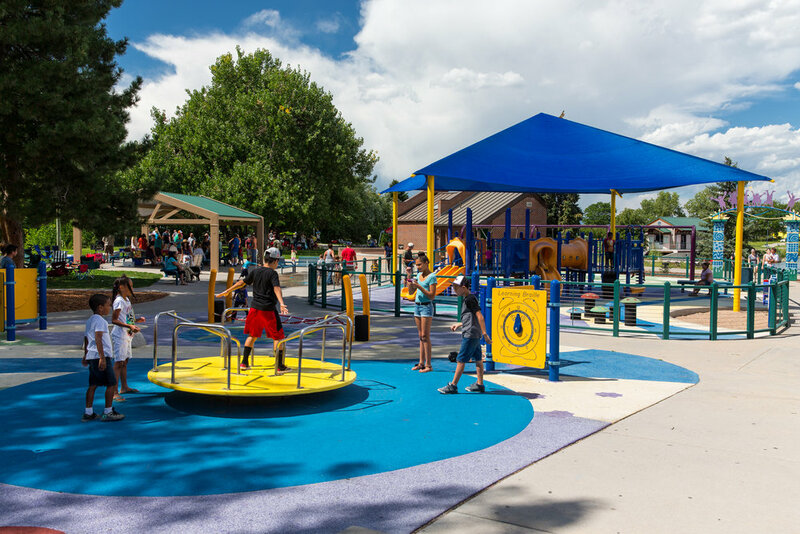 The rubber surfacing at the play areas is brightly colored with eye-catching designs, and utilized a tire-recycling incentive program administered by the Colorado Department of Local Affairs, which provided substantial cost savings. An area for seniors has chess tables, benches with backs, and a raised stage. The teen area has both a small and a large sculpted rock climbing structure to challenge all levels of skill.